Size of this preview: 352 × 598 pixels. Deutsch: Schematische Darstellung des „Overton-Fensters“, basierend auf den Theorien, vorgestellt von Joseph P. Overton (1960-2003), dem ehemalige Direktor des Mackinac Center for Public Policy. 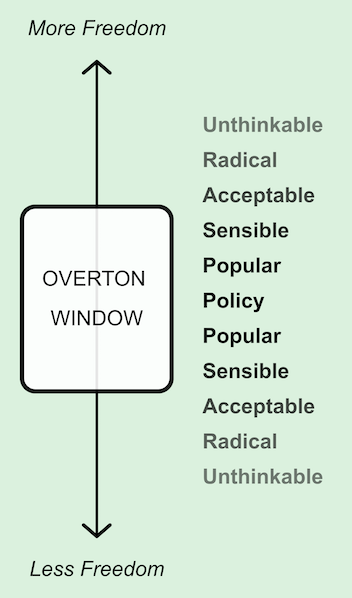 English: Diagram of the “Overton Window”, based on the theories promoted by Joseph P. Overton (1960-2003), former director of the Mackinac Center for Public Policy. Español: Diagrama de «Ventana Overton», basado en las teorías promovidas por Joseph P. Overton (1960-2003), ex director del Mackinac Center for Public Policy. Français: Schéma de la "Fenêtre d'Overton", basé sur les théories promues par Joseph P. Overton (1960-2003), ancien directeur du Mackinac Center for Public Policy. Italiano: Schema della "Finestra di Overton", basato sulle teorie promosse da Joseph P. Overton (1960-2003), già direttore del Mackinac Center for Public Policy. To embed this file in your language (if available) use the lang parameter with the appropriate language code, e.g. [[File:Overton Window diagram.svg|lang=en]] for the English version. Diagram of the “Overton Window”, based on the theories promoted by Joseph P. Overton (1960-2003), former director of the Mackinac Center for Public Policy.